In a change of pace this episode doesn’t feature a mystery; instead it features the team talking about SE Asia. Steve recently returned from a trip there and Team Sideways took the chance to discuss some of the more memorable things from his travels. The rumor that began with a Reddit post and metastasized into a tabloid sensation is... not true. Steve, Devin and Joe saddle up one last time to bring you the truth. Lots of incredible things are being developed while we're way! Stay tuned to this feed for some great new stuff. In the meantime we've got a clip to share on the Menendez case from our good friends at Generation Why. In Part II of our collaboration with Minds of Madness podcast, we identify a suspect in the strange death of Greg de Villers. 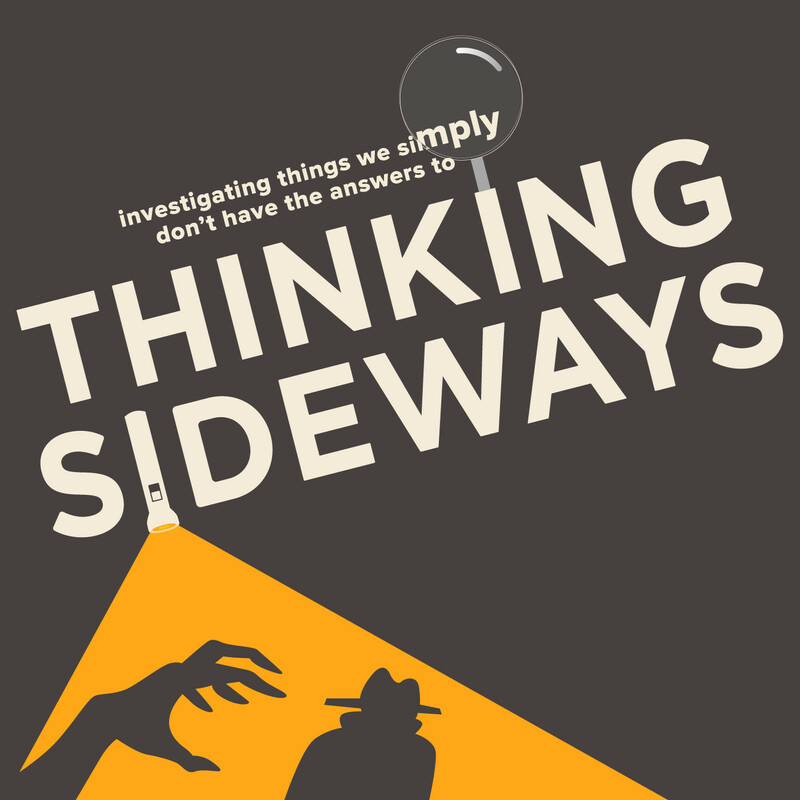 The Sideways Gang teams up with our friends at The Minds of Madness to discuss the murder of Greg de Villers. This is the last episode of TSP and we wanted to have some fun with it. So here are the final bloopers from this years episodes. Oh, and there is a lot of swearing. In the early 1970s Tatunca Nara, last Chieftain of the Ugha Mongulala, revealed the existence of his tribe’s greatest secret—the vast city of Akakor, hidden deep in the Amazon jungle. Several have died trying to find the lost city, but no Westerner has yet laid eyes on it. Why could that be? In August 1971 a group of hippies were partying at Stonehenge when a freak lightning storm, accompanied by blue lights, took the group by surprise... and may have been the cause of their disappearance. A story about some guys who got confused on a roadtrip... or did they? For decades reports of a mysterious cryptid that drank the blood of goats have been circling the globe. Originating in the equatorial region of the Americas stories are now coming in from all across the globe. What is this strange creature, what does it want with our goats, and why does it insist on smoking that cigar? Federal prosecutor Jonathan Luna left his office to go on a long solitary midnight drive, and then was discovered dead the following morning, under very suspicious circumstances, many miles from home. What happened to Jonathan Luna? Anna was 5 years old when she disappeared on a rainy day while playing near the creek behind her house. Though it seems she could have just fallen in and been washed away, divorced parents and stories from her two older brothers seem to suggest something more sinister happened. People keep finding bodies that have been burned to ash while everything around them is left untouched by the flame. Some claim these are cases of spontaneous human combustion, others say something else is going on. Who is right and what’s the deal? Is spontaneous human combustion real? 23-year-old Lisa Bishop left Miami for Haiti on an old rusty freighter named the Freedon. Neither Lisa nor the ship were seen again, though there's some disagreement about the ship. After attending mass and delivering gifts, Larry Griffin started his normal postal route at noon on Christmas Day, 1929. Despite having attended dinner at two homes and being a guest at many others, no one knows where Larry ended up that night, or any other night since. In 1920 a man living in Washington state claimed to be the only survivor of the famed Battle of the Little Big Horn. Was Frank Finkel there or was he just another one of the many attention seekers who hoped to attach themselves to the story? Did Frank Finkel survive the Battle of the Little Bighorn? A member of the Scottish National Party and an anti-nuclear activist, William MacRae was found dying in his car after an accident--and later it was discovered that he'd also been shot in the head. Who killed Willie MacRae? Down the Rabbit Hole, a sneak peak at the bonus content available on Stitcher Premium-Daniel Burack was on his boat, the Witchcraft, just offshore from Miami Beach, when he radioed the Coast Guard asking for a tow because of boat trouble. When the Coast Guard arrived 19 minutes later the boat and crew had vanished without a trace. All American Ronald Tammen disappeared without a trace from his dorm room on an abnormally cold night on April, 1953 after finding a dead fish in his bed. Was the fish an unrelated, harmless frat prank? Or did something very sinister happen to Ron that night?